How and why did I get into the biz? As I said last time, I was born at a major UK sporting venue, on a par with Twickenham or Wimbledon. I was a keen and able sportsman from the start, had newspaper ink coursing through my veins, was always rushing home from events to knock out mock newspaper reports, and knew from an early age exactly how I wanted to make my way in life. And if you believe much of that … in reality, I didn’t have a clue about what I wanted to do, right up to the time I tumbled into my first job. How did I get into journalism? Almost accidentally, but certainly fortuitously, since there was probably no other thing I could have done with any degree of success. Above, I’m the good-looking one in the middle. 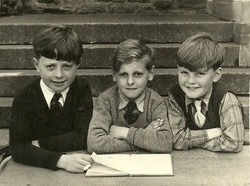 Ten-year-old boys used to wear ties to school in those days. This was at Cwmcarn Primary, where I was (briefly) as bright as a supernova. 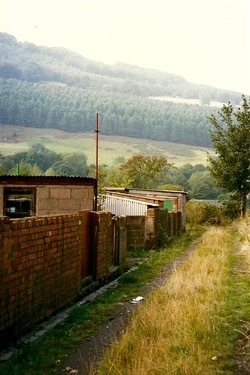 Right, the theatre of dreams: back lane, Marne Street, Cwmcarn. For some reason if you were born in Monmouthshire in that era you could play for Wales or England. So this is where I partnered Ivor Allchurch in the red shirt, when I wasn’t part of a lethal bowling partnership with Fred Trueman. Caerleon near Newport, South Wales, where the 2010 Ryder Cup was staged. On 18 October 1947 it was the Lydia Beynon nursing home. I was a bit of a precocious sports star. There is a grain of truth in that. Opening fast bowler for the feared Cwmcarn Primary School cricket team, and lethal, jinking inside forward for the soccer team. I was also a bright little bulgar. When it came to any kind of test, like Brian Clough, I was in ‘the top one’. But everybody reaches their zenith in life, then begins to drift down the slope. Unfortunately I peaked, on and off the pitch, at 11. After sailing through the 11-plus I jogged along at Newbridge Grammar school, much as I did during the dreadful cross-country runs. South Wales has hills, and I’m not talking about the gentle incline past the castle mound in Cambridge. They are sheer, and sheer hell when you’re following a maniacal PE teacher called Chunky who used to say things like: ‘Right, lads. Imagine there’s a Jerry machine gunner at the top of that slope.’ (It wasn’t all that long after WWII) ‘Let’s see who’s first to get him with a bayonet.’ You couldn’t make it up, and unfortunately I’m not. Strange, then, that as my cricket and soccer skills dwindled – we were a rugger school, and soccer was even banned in the yard at break time – the only sporting claim to fame of my youth was finishing in the top 30 one year in the Monmouthshire Cross Country championships. But it is a dark tale of devious skulduggery. Already out of sight of the rest of the field, we jogged to a point where we could see the course, but stay concealed. And then eventually, after an interesting time chatting about Del Shannon and Newport County, we counted about 30 runners puffing past, waited for a big enough gap in the race, and joined in, for about half a mile to the finish. We didn’t need to feign exhaustion – that was far enough to knacker us. But I think we did have a little sprint to the line. Our team finished with a respectable (in one way) points total. And we did own up to our skipper, eventually … when he suggested we might display our unexpected prowess in another event. possible career. I was good at essays, or compositions as they were known then. I couldn’t take much credit; it was in the genes. My dad, Mel, was a brilliant and hilarious teller of tales, usually about his wartime escapades, which anticipated ’Allo ’Allo by a few decades. Kids would call at our house ostensibly to play with me, but really to hear the old man’s stories. If he wasn’t there, some suddenly remembered other things they had to do. Still without any idea about the future, well into my later teens, I did develop one burning ambition; to get out of the valleys. Find out why next time when I head off to England and the Swinging 60s. But now to conclude this episode, it’s into the Time Tunnel once more and back to United’s dark ages. John Ryan, as we have already established, did not manage to get much right in his mercifully brief reign at the Abbey. Not even when it came to the faltering manager’s last resort … the press ban. Many a bungling boss gets around at some stage to blaming the messenger but Rhino, weirdly, banned himself. It was in 1984, when the U’s were ploughing, like a blind man behind a lame horse, through that League record 32-match stagger without a win. For some reason Rhino, whose hide was nowhere near as thick as his nickname, became even more outraged than usual by my completely unjustified (of course) critical reports. Instead of banning me from the pressbox (and saving me from yet another pathetic performance) he let it be known that he would no longer speak to me before matches, therefore in theory making it extra difficult to construct preview pieces. In future he would not be available, but the line-up for the next defeat (sorry, match … and sorry they certainly were) would be read out by his secretary, who in fact was the club secretary’s secretary, a delightful lady called Mandy. The News would then publish the line-up, but struggle for any kind of story, which would knock us bolshie journos into shape. It went on like that for a while, and we published the lot, along with a picture of Mandy holding the team sheet. We only needed two such previews. Mandy’s boyfriend had a word with Ryan and normal service was resumed. We sent Mandy a huge bunch of flowers, Peter Barnes scored, United amazingly led Leeds 2-1 with four minutes to go, but conceded the equaliser as the winless wander stretched to match number 28.